Anyway, I still find everything about this franchise to be fascinating. I don't think I will ever get used to how good the effects are. I'm pretty sure that I felt the same way about the first film in this series but even that now pales in comparison to what these filmmakers are now capable of. 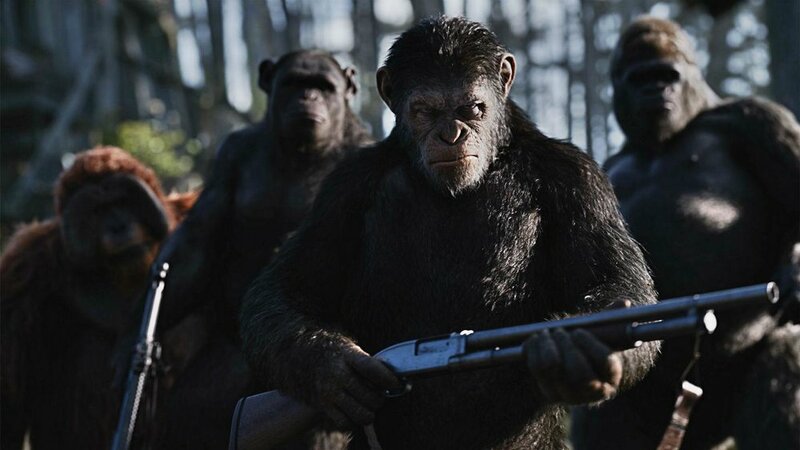 They've got to the point where apes can ride horses and wield guns while the audience doesn't think twice about it! That's how brilliant this trilogy has been. Their pacing has been fantastic. However, Reeves cannot get all of the credit. Andy Serkis is perfect as Caesar. He's had a few goes at it by now but you can really tell that he puts his heart and soul into the character. Caesar is a hero in this film. He is a natural born leader and it is easy to see why his brothers in arms would be willing to follow him into the jaws of death. There are several other great motion captured performances but Serkis is the star of the show here. Even through all of the special effects, his raw emotions shine through. He is incredible! If ever there was a film to showcase why motion capture should be acknowledged by rewards ceremonies, this is it! The other apes in his crew all have their own looks and personalities so you get to know them well throughout the film. When Caesar loses a friend, we feel it. We understand why he would go to these incredible lengths for his people. They are good people. The War for the Planet of the Apes sees Caesar go up against a particularly nasty army of humans lead by the especially nasty Woody Harrelson, who plays the Colonel. As with most of his roles, he is great in this! It's a typical mad war monger role and yet Harrelson makes it work. He truly is a despicable character. In previous films, you may have been able to choose a side but in this, it truly is good vs evil, with Caesar and the Apes being the good. If you take a step back from the film to think about it, it should be much more difficult to root against your own species but that's part of the beauty of this film. It humanizes the apes while showing the worst in the actual humans. Perhaps it would have been a better choice to leave the right and wrong sides to be more ambiguous but for those who have seen the original film, we already know the outcome of the planet and so really there's no need. If this is to be grand finale, we may as well root for the winning side and end on a high. It is also a bit on the long side. I wouldn't take anything out of the film but at 140 mins, it sure does drag on... The tale is an epic one and so it deserves this running time, however, this isn't a film to check out if you are tired! The hype surrounding this franchise has never quite reached the levels of say the Marvel Cinematic Universe, which is a shame- but that's only because installments cant come as regularly! However, when you see a film like this, you can see why. They take their time and it pays off in spades! Honestly, if you don't see this film then you are missing out on what film is capable of! It's got escapism, spectacle, heart and even the odd dash of humour here and there! This gets an A+ from me. As I said, this could be a great finale for the franchise but if that isn't the plan then sign me up for the next one. I'll be there! This is one of the best films of the summer and perhaps even of the year! And with that, all that is left to say is: Hail Caesar!